Cafu and Serginho say goodbye! Both Milan's full-backs, Cafu and Serginho, officially announced that they will be leaving Milan after Udinese's game on Sunday after five and nine years at the club respectively. Both Brazilians will be out of contract with the Via Turati outfit once this season comes to a close. After spending some fantastic years together they have now decided that it is now time for them to move on. Marcos Cafu has expressed his desire to return to his country, Brazil, where he will play his last few years of football. 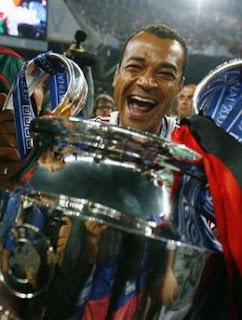 The smiling right-back has won everything with Milan and his arrival from Roma in 2003 was warmly welcome. His effortless runs up and down the flanks even at his tender age still causes some defenders problems when he attacks while his defensive skills still impress the fans. He will be sorely missed by both sets of Milan and Roma fans after he graced Italian footb all for 11 years. Serginho arrived at Milan nine years ago, along with the likes of Gennaro Gattuso and Andriy Shevchenko and he has been a loyal Milanista since. A natural left-winger Ancelotti siezed the opportunity to slot him in defense when short of players and il concordo never looked out of position. His versatile style of play has proven helpful for the rossoneri in times of need and his ability to cross a perfect ball into the box will surely be missed. After suffering for two years with a back problem Serginho has decided to hang up his boots and his future is yet unknown. The two Samba kings brought a little Brazil to Milan and their positive persona's will never be forgotten after years with the rossoneri. From Cafu's gum-chewing smile, to Sergio's flashy flank runs the fans have already started to miss them and they haven't even left yet. Good luck to them, we will never forget you!